I've got some goodies for you today! I recently received the new Butter London collection from a contest win and was so excited to swatch them! First we have Dodgy Barnett. 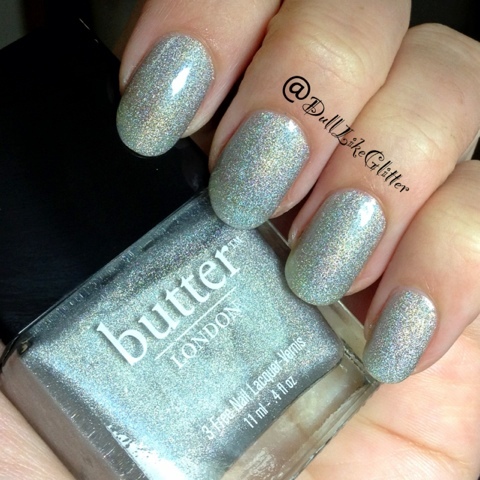 This gem is a silver holo nail polish that will refract rainbows of color back at you. With two coats there was a slight visible nail line so this used three. Gobsmacked is up next! 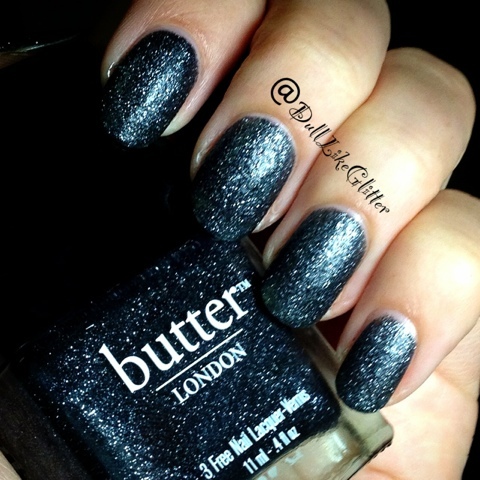 This edgy, black polish is strewn with silver glitters. The application on this one was a little clumpy as some of the Butter London glitters seem to get but was fully opaque in two coats. Lovely Jubbly is like jewelry for your nails! It is packed with purple/pink glitters and has gold, red and blue glitter strewn throughout. My little sister is in love with this one but I"m not too sure where I'd be wearing it out that often. Two coats was a good cover but you may need three for an opaque look. This is nice though because you can layer it! 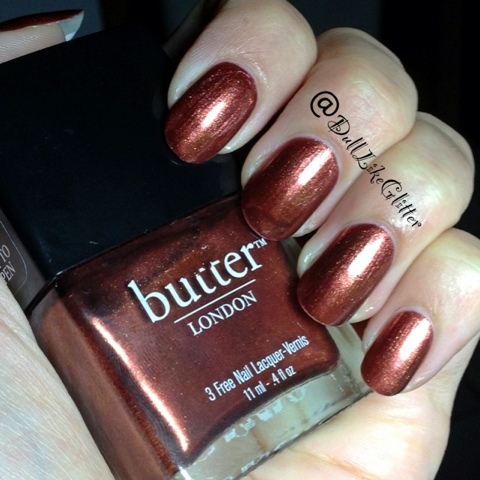 Shag is a multidimensional warm copper with lots of shimmer! In the bottle I wasn't a big fan but on the nails I'm really liking it! Two coats was great! Finally my favorite, Trustafarian. 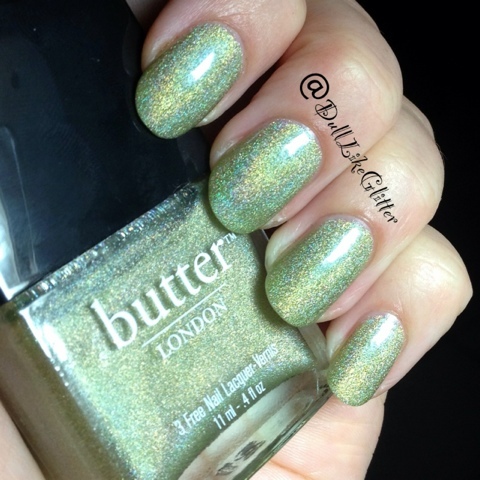 This is a golden holo much like Dodgy Barnett with warm green tones. Just like the silver, two coats was a little sparse so I went with three but this could be lots of fun to layer over different colors. The rainbow effect is absolutely gorgeous and this one is a must have! Usually I use a white, artificial lighting to get the most accurate color of my polishes but for the Butter London holos I feel that sunlight really catches more of the refractory rainbow effect. This is a second shot of Trustafarian in sunlight! Final thoughts are the holo polishes, Trustafarian and Dodgy Barnett will be the hits of the collection! If you like those and are in the U.S., Butter London released a website only teal/blue holo in the same family as these two called Fishwife. You can pick it up here for $14. I may have to go for it, these holos are gorgeous. Shag and Lovely Jubbly are my next favorite followed by Gobsmacked in the rear because of the formula consistency.